UPDATE: Stewart has since deleted the tweet, but never fear -we have a screen capture posted below! 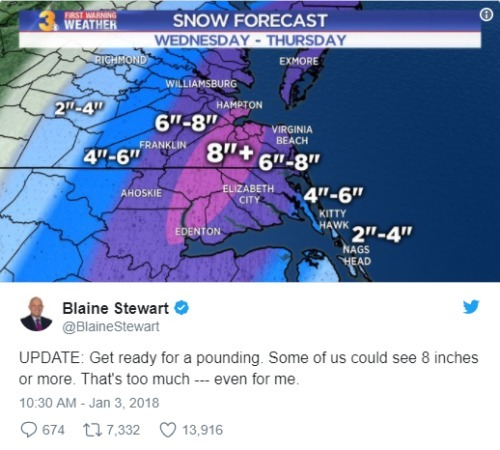 Out news anchor Blaine Stewart may be the funniest reporter in Norfolk, Virginia, but today he won the internet with his humor. As a monster storm descends on the east coast – dubbed a “bomb cyclone” by weather forecasters desperate to top the term “Snowpocalypse” – all eyes are on the developing catastrophe. Stewart, however, took a little lighter approach to impending dooooom. He took a, shall we say, cheeky method for warning locals that Armageddon approaches. Now we just need to know whether or not this storm will bottom out or stay hard and ready to slam us. 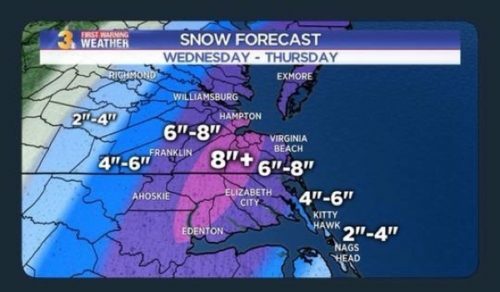 Blaine Stewart’s now-deleted tweet about the “bomb cyclone” hitting the East Coast.